This is a film everyone should see and luckily the writing, directing and acting are excellent which makes seeing it even more worthwhile. As far as war movies go, this one is really top notch. Critically acclaimed, and Academy award nominated, American Sniper heads to stores May 19th on Blu-ray/DVD/ Ultraviolet combo pack. Based on Chris Kyle's autobiography, the movie makes you think beyond the typical war story. While there are still the dead bodies, the film makes the audience think beyond the bullets to the human emotional toll that war takes on soldiers and their families. Chris Kyle (Bradley Cooper; The Hangover, Limitless) was never going to make it as a cowboy. Roaming around Texas with his brother, Jeff (Keir O'Donnell,Dawn of The Planet of The Apes), he seemed to have no purpose until he walks into a military recruiting center. Always a good marksman, Kyle decides to join up and train to become a member of the elite Navy Seals. Sent to Iraq as a sniper, Kyle would ultimately return four times, killing countless enemies and earning the nickname "the Legend". With over 100 confirmed kills, and on his way to a long and decorated military career, Kyle abruptly quits remaining stateside with his family. American Sniper is intense to be sure. Those moments before Kyle shoots his target are a calm before the explosion and you find yourself steadying your breathe right along with Cooper as he lines up the shot, inhales, exhales and pulls the trigger. It is also emotional, hard to watch and sobering. The atrocities of war are laid out in horrific ways and the story is gut wrenching as the audience watches Kyle struggle to acclimate back to civilian and family life each time he returns from Iraq. There is a reason Cooper was nominated for a best actor Oscar. He morphs from the thin, statuesque, handsome actor we know into a burly, stacked, and rough around the edges Texan who believes in God and Country while taking on the role of protector and leader. He is part of the reason the film is so intense and he displays Kyle's every emotion with minimal movement and effort. It was truly a stand out performance worthy of the accolades he has received. Almost equally as noteworthy is Sienna Miller (Casanova, Layer Cake) as Taya Kyle, Chris's wife. Strong and confident, she is the glue that holds Chris together when he returns from war. She is his "rock" and their love story is as much a part of the film as the tortured war hero is. Miller handles herself well next to Cooper and their chemistry makes the romance believable. The combo pack offers only two extras, The Journey of American Sniper and The Making of American Sniper. Both featurettes run about 30 minutes in length and are absolutely worth watching. Unlike many extras from other films, these give the audience a real insight into who Chris Kyle was and how involved the making of the film was. The 1080p video and Dolby Atmos 7.1 Audio enhance the drama and intensity of this film in particular. Every gunshot and all the action can be seen and heard in true clarity that helps immerse the audience into the world of a Navy Seal. While elements of the film could be considered American propaganda and certainly have a bias slant towards America as the "hero" and Iraqis as the barbaric villains, the theme is really about the personal struggle soldiers and their families endure. American Sniper brings that idea across beautifully and touchingly while telling the story of a real man who simply wanted to serve his country. Download American Sniper from the iTunes Store in Digial HD. 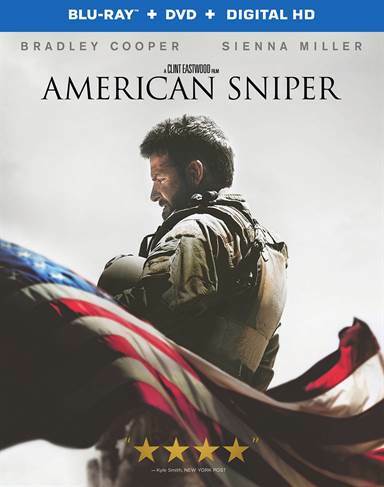 For more information about American Sniper visit the FlickDirect Movie Database.